(Lanka e News -30.July.2018, 7.00AM) The cabinet decision conveyed at the media briefing Wednesday (25) confirmed that the 19 heroin dealers in jail shall be executed .To president Pallewatte Gamarala implementing the capital punishment is more important than the GSP plus concessions which have already proved to be a boon to the country . Gamarala’s stubborn as a Mule attitude is because his son is addicted to drugs .This is what has made him most vindictive and venomous against the drug dealers while showing least concern for the country. It was reported again that the cabinet has given unanimous approval for the president’s decision. It is a well known fact even the barbaric practice of pounding infants in mortars was lawful in Sri Lanka during the period of the grandfathers and great grandfathers of the present elderly generation . Incidentally , the grandfather of the writer was born in 1895. When the infant of Ehelepola of Kandy was killed by pounding in a mortar in 1815 by the mother of the child who was made to do it, the great grandfather of the writer was a youth. After that cruel episode when King Sri Wickrema Rajasinghe was taken as prisoner by ship by the British to Goa ,his physician asked the King , why was such a cruel punishment meted out ? The king very simply answered , the Sinhala rules of the kingdom were not made by him , and he only implemented the decision approved by the then cabinet in accordance with the rules ( Read Dr. Marshal’s diary ) . In the past people were killed according to whims and fancies under various pretexts : Those killings included the ‘death to traitors’ label fastened on the victims by the Left after using the word ‘discard’ (iynkireema). ( The word ‘discard’ was coined by Rohana Wijeweera. Interestingly , the writer heard this word for the first time from the mouth of Wijeweera). While parading most pompously as their own after borrowing what belongs to others , Sri Lankans are a breed which chooses the most easy primitive system- dying rather than living when trying to solve problems .This was the system to which the rulers, groups with opposing views, Leftists, revolutionaries, and the ordinary people were accustomed . If it was not so , this tiny Island will not have earned the inglorious distinction as the country with the highest suicide rate. This is because of the deeply embedded notion among them that the easiest way to resolve an issue is through death. If the government is to introduce death penalty as a matter of policy , that law should apply to all equally and indiscriminately. A civilized government cannot therefore save the lives of only those it fancies , while picking and choosing for killing those whom it resents. Yet based on another news report it was most clearly enunciated by the cabinet spokesman, when implementing the death sentence delivered by the courts , only some drug dealers are to be executed , that is only the 19 culprits named by the police intelligence division shall be executed. This is unlawful, a wrong method and unethical. According to the country’s laws , after the death sentence is delivered by court , it is implemented only when the president signs it and the laws have laid down the procedure for that. He cannot therefore pick and choose those sentenced for signing. Before the president places his signature approving the death penalty of a particular individual he must call for reports from four ‘sides’and get their unanimous consent . The four are : the chief justice , the Attorney General , minister of justice and the panel of judges or the judge that delivered that verdict. Hence, though the court delivers a verdict of death sentence , four more parties should confirm that the verdict is correct . 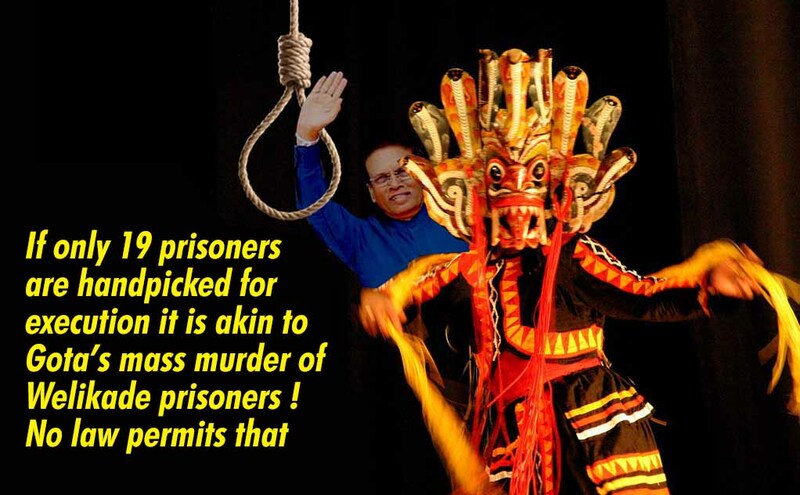 It is then and only then the president can give his consent to the death penalty.There is no other procedure than this under Sri Lankan laws. Therefore the president cannot assign this task to another committee as revealed by him recently at the Moragahakande reservoir .If he wishes to do that there must be a constitutional amendment or a new enactment shall be passed. In the circumstances , if death penalty is to be implemented in accordance with what the cabinet spokesman revealed , that can only be done only on the lines of the procedure in the aforementioned paragraph , and there is no other option. The question is why neglect to state this…. What is being said is , capital punishment shall be implemented against the 19 prisoners because they are continuing to engage in drug business while they are already serving sentences for drug offences in jail. This premise is weird and most rudely shocking for while saying this , those who are serving death sentences for murder are not being executed ! A fresh case ought to be heard. Under these circumstances , it is nothing but fair that a fresh case is heard against those who have allegedly engaged in drug deals while being in jail , and in addition a separate investigation is carried out. In that event without any doubt all the groups including prison officers who aided and abetted the drug dealers within prison shall also be incriminated when new charges are filed. Otherwise than that nobody has any legal right to execute anybody summarily. What is important is , without singing stupid senseless bailas, implement the death sentences passed on all those found guilty without exception in accordance with the law. On the other hand, if only 19 individuals are to be executed because the police information service wants to, it is akin to Gotabaya Rajapakse sending the forces unlawfully into the prison and killing a group of prisoners including those charged with drug offences , as well as the murderers who allegedly killed the Kotte Vihara monk when they went to the Vihare to rob the sword at the behest of Rajapakses. In case it is another prisoner ( and not those on whom death sentence has been served) engaged in drug business within prison , that is , he is an individual who is in jail serving a sentence of about 15 years , and embarks newly on drug business while being within prison , what has this group for execution got to say? In case if it is a prisoner who engaged in drug business other than the group of 19 prisoners referred to who are sentenced to death , what is the position ? If the prisoner who is facing charges of robbery or any other and jailed for 15 years or thereabout , starts drug business newly while in jail , are these ‘gentlemen’ clamoring for capital punishment going to implement the death sentence against him? How can death penalty be implemented without a trial ? If not , is he going to be permitted to go on with his drug business while he is in jail? Surely these ‘gentlemen’ must furnish answers to these questions. It is to be noted all the prisoners on whom sentences have been delivered are under the custody of the courts . The prison officers are only protecting that custody .If the accused who is meted out punishment is not rehabilitated , and continues to commit the offence time and again , that responsibility should be shouldered by the courts and the prisons, in other words , the government. In the circumstances the civilized citizens therefore cannot permit the president to wreak havoc simply because he wants to earn cheap popularity or pay off a personal grudge taking advantage of a responsibility that has not been duly discharged by the government. This is most imperative because if a local ‘Gotler’ alias ‘Hitler’ emerges and comes to power he can use this pernicious precedent to swell his already swollen head to the point of explosion and lead the country into a volcanic eruption. .
President stubborn as a Mule: Capital punishment even at cost of GSP ; to kill 19 based on specific choice!